On 10/19/05, the daughter of one of my MIT friends shadowed me for a day at work as part of a school project. One of the good things about spending time with children is that it forces you to explain things in simple terms. That day, I drew lots of drawings. So here is another installment Erik explaining things with drawings. 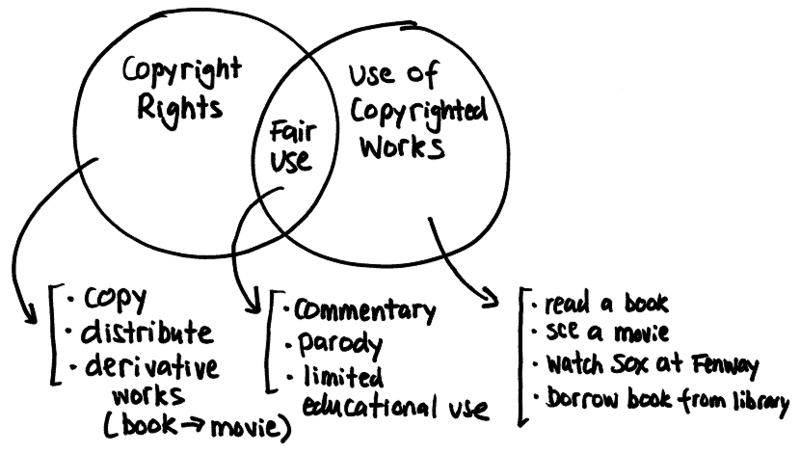 In this drawing, I attempt to explain the wonderful world of copyright law. As an aside, I think that all intellectual property (i.e. patent, trademark, copyright, and trade secret) lawyers like writing about copyright. Because we’re all familiar with stuff that copyright protects – books, movies, CDs, DVDs, radio, TV, and the like. Even if, like me, they don’t practice copyright law. What most people don’t appreciate is that there are three types of uses of copyrighted stuff. And not all of those rights are protected by (and hence can be legally controlled by) the copyright owner. Have you ever seen a copyright notice that says “It is illegal to make a copy of this copyrighted document”? Well, that’s not true, because it excludes fair use. I’ve often thought that the Copyright Act should be amended to say that all copyright rights are forfeit if an incorrect copyright notice is placed on a work. But that will never happen. On to my drawing. My drawing could be better. And my explanation could be better. But again, I drew this for a child, so it’s a good place to start. 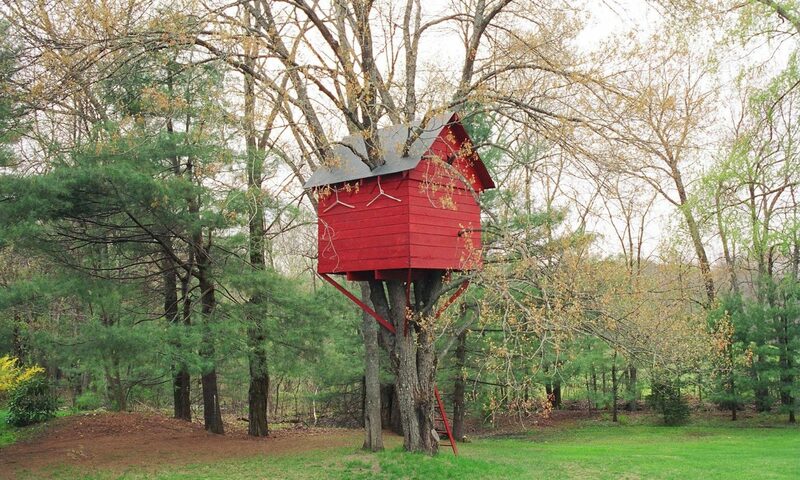 The main point is that there are three classes of uses: unregulated, fair use, and protected. And you have to think carefully about which type of use is which. Many copyright owners fail to do this, unfortunately. This article is licensed under a Creative Commons Attribution-Noncommercial-Share Alike 3.0 United States License. I believe “Watching the Sox at Fenway” is actually outside both circles. There’s no copyright in a baseball game (no creative expression and no fixation). At best, you could claim some sort of copyright in the uniforms or in the advertisements sprinkled around the park, but that’s a stretch. The broadcast can be copyrighted, but the game itself can’t. Thanks for the explanation. I wish wikipedia articles followed a similar approach. Clear and concise. oh one more thing- do you mind if i use your drawing in my thesis with reference to you ( of course). Hello, I am a student doing a masters in Management Policy and Entrepreneurship in Health and life sciences.. I would like to know more information for my end of school Thesis. I am writing about IPs regarding basic sciences e.g. patenting of DNA — I would like to know your opinion, and why you have this opinion. I also would like to know if you think this will slow down the progression of basic sciences.